OBDII 12V Memory Saver allows you to disconnect your vehicle’s battery without losing electronic presets including: radio/clock settings, seat positions, alarms, GPS, keyless entry codes, and more. It’s so easy to use. 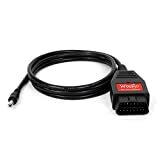 Simply attach OBDII 12V Memory Saver to vehicle’s OBDII port, connect other end of Memory Saver cable to 12V/10A output in Weego Jump Starter Battery+, and power on Weego before disconnecting vehicle’s battery.